Immunotherapy drugs can be more effective against cancer when combined with other therapies, such as radiation therapy, targeted drugs, or other immunotherapy agents. Clinical trials that are currently underway are testing such combinations in a variety of cancers. It might seem that immunotherapy and chemotherapy make an unpromising pair. Chemotherapy, after all, is known to lower the immune system response, so combining it with an immune-stimulating agent might appear to be counterproductive. 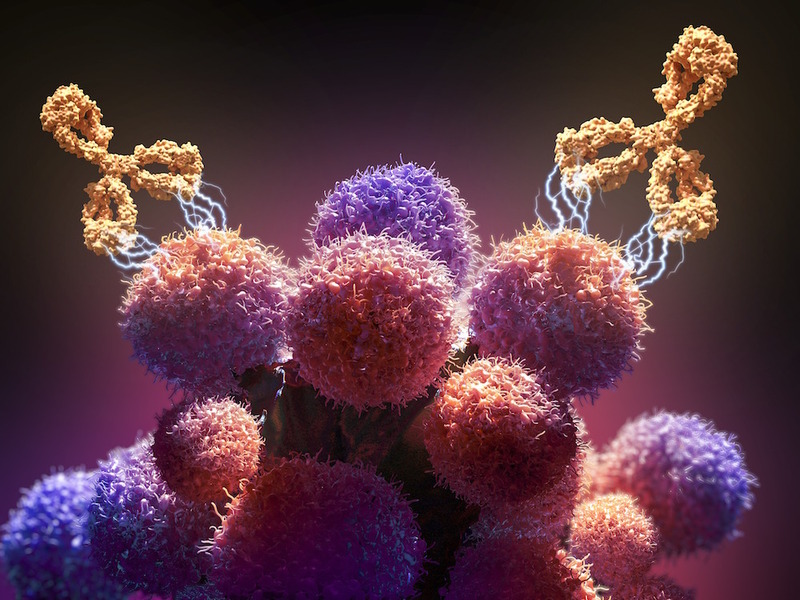 An illustration of a monoclonal antibody drug—a type of immunotherapy—attacking cancer cells. That was the thinking—until a clinical trial in patients with metastatic non-small cell lung cancer (NSCLC) showed that the use of the immunotherapy drug pembrolizumab and chemotherapy together substantially increased how long patients survived before the disease worsened. The U.S. Food and Drug Administration approved the combination in 2017 as a frontline treatment for people newly diagnosed with NSCLC. The results in NSCLC have prompted scientists to launch clinical trials of immunotherapy-chemotherapy combinations for patients with colon cancer or advanced triple-negative breast cancer, says F. Stephen Hodi, MD, director of the Center for Immuno-Oncology at Dana-Farber. What explains immunotherapy-plus-chemotherapy’s effectiveness against NSCLC and, potentially, other cancers? Scientists aren’t sure, but they have some theories that are being explored. First, while it’s true that chemotherapy suppresses patients’ immunity, the immune system includes a range of different types of cells, including regulatory T cells (or Tregs), whose job is to rein in the immune response. When chemotherapy reduces the number of circulating Tregs, it may actually invigorate some aspects of the immune system, says Dana-Farber’s Osama Rahma, MD, of the Center for Immuno-Oncology and a specialist in gastrointestinal cancers. Some scientists theorize that the die-off of cancer cells produced by chemotherapy causes a release of antigens, which are proteins that identify cells as foreign. The antigen release may help trigger an immune response to the cancer. Other researchers have suggested that chemotherapy produces changes in the tumor microenvironment—the tissue that supports tumor growth—such that the immune system can more readily attack the cancer. Testing these theories may help scientists improve the effectiveness of current combinations of chemotherapy and immunotherapy and extend them to other types of cancer. Hello- is immunotherapy recommended for breast cancer patients? My original diagnosis was in 2014 Stage IIIA and spread to the lymph nodes. I was recently told that my breast cancer metastasized and the ct scan shows that it is in my bones, liver and lungs. I am PR positive (5%) and Her2 negative. Thank you! Where I will get the details of the clinical trials? May be the answer lies in the clinical trial protocols! Have cancer and rececent scan showed it in the liver. Was told I only have months to live. Are there any clinical trials I could take part in.